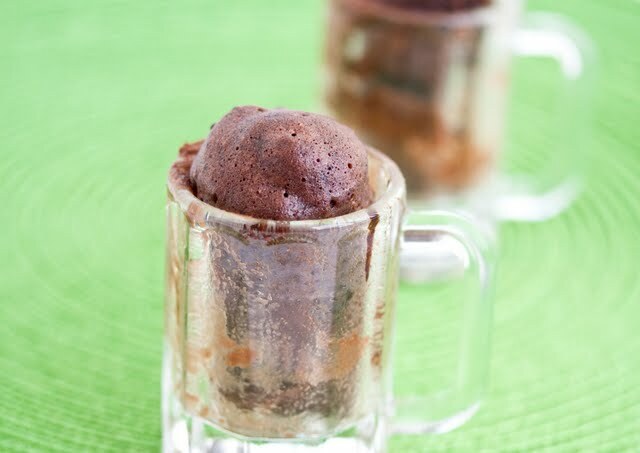 I’ve been wanting to make a chocolate stout mug cake. With St. Patrick’s Day right around the corner, these are a perfect treat. I even got the idea to cook these in beer mugs, and I’m pretty happy with how they came out. I do wish there were beer mugs that aren’t clear glass though because I don’t particularly like how you can see the cooked cake sticking to the inside of the mugs. I tried washing the mugs after cooking the cakes and placing them back. Not sure which look I like better. Much of the beer disappears when the cake cooks and you don’t really taste it. But what remains is the nuttiness of the stout, which goes great with the chocolate. 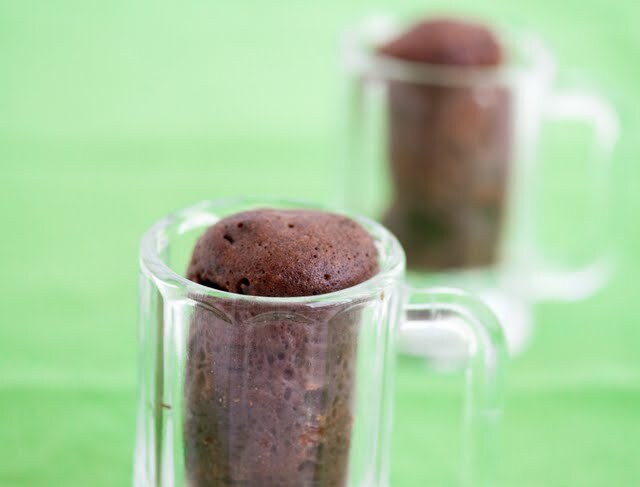 Stout beer and chocolate is a great combination and this mug cake is an easy way to make a quick treat! Cook in the microwave for approximately 1 1/2 minutes. Make sure not to overcook or the cake becomes rubbery. awesome! I’ve been obsessed lately with dark beers (even though I rarely drink them), particularly the ones that taste like chocolate (Young’s, Rogue’s, Guinness black label)! this will fun a fun recipe to try. i’m sure my husband will love this! I love the flavor the dark beer adds to the cakes! Oh my! 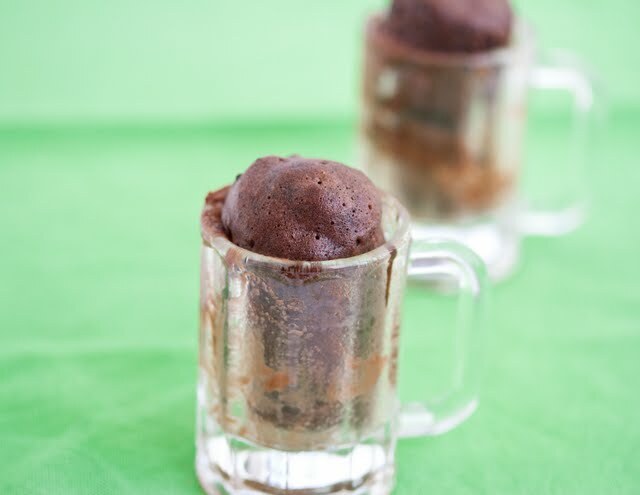 Chocolate and beer, could this post be any more tempting? What size mugs did you use by the way? 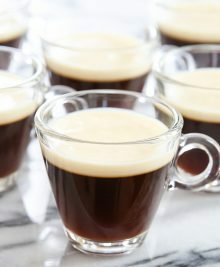 They do seem like a great dessert choice for St. Patrick’s, with maybe a bit of green white foamy icing on the top and a 4-leaf clover accent, it would be perfect! I used the smallest ones I could find. I’m not sure how many ounces they are. Maybe 8 or 10? I’m a little skeptical of this because I’m not sure how well beer and chocolate pair but I really want to try it! It looks really good 😀 Thanks for all of your AWESOME recipes!! It actually pairs well in my opinion. I’ve also made regular Guinness chocolate cake and it’s delicious. The guinness basically adds a nuttiness to the chocolate flavor. It’s quite amazing! I just made a chocolate stout muffin bread from another blog and it was heavenly. Guinness is a nice thing, I suppose…but, given the ‘chocolate’ part of this cake, may I suggest something even MORE fitting? To wit, British brewery (Wells and )Young’s creation, Double Chocolate Stout. Not only a good, solid stout but made with both proper, dark, chocolate and a chocolate malt. Hi kirbie…iv just dicovered your blog and in love wth your mug cakes cant wait to try them all out! a suggestion tho how about a cake made with coke ? im sure it with be devine dense and moist . I made this recipe following the instructions exactly (except for the type of beer… i had no Guinness so i just used Blue Moon) and after two minutes (1 1/2 + another thirty seconds) the cake is… almost completely liquid. Should I let it sit for a while maybe? This really was designed specifically for a stout. unfortunately substituting another beer probably won’t work. sorry! you can probably try continuing to cook it, but i’m not sure how it will end up tasting. Really loved this cake but massively reduced the sugar – from 5 to 2 tablespoons. glad you liked it! When I originally made this, I got a few complaints about the bitterness from the stout, so I reformulated to make it sweeter. But I actually like mine less sweet too.